Today is Ada Lovelace Day and unfortunately I am stuck at home waiting for a network engineer to come and fix my intermittent internet, rather than joining colleagues in Edinburgh for this year’s event celebrating Women in STEM. Ada Lovelace Day is always one of my favourite events of the year so I’m gutted to miss it, especially as there will be periodic table cup cakes as designed by chemist Ida Freund! However I’m planning to participate remotely so that I can defend my Metadata Games crown and I am also hoping to write a Wikipedia article about a woman from this field who was an inspiration to me when I was a student. 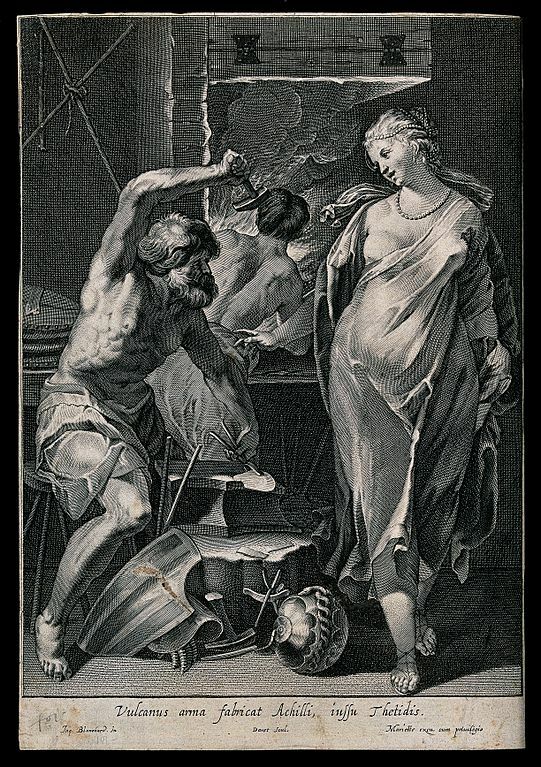 Vulcan hammering metal at a forge watched by Thetis. Engraving by Daret after Jacques Blanchard. CC BY, Wellcome Images, Wikimedia Commons. Dr Elizabeth Slater was a lecturer in archaeology when I studied at the University of Glasgow in the late 1980s and it was as a result of her lively and engaging lectures that I developed an interest in archaeological conservation. I believe Liz started her academic career as a scientist, before developing an interest in archaeometallurgy, and from there moving into archaeology. Liz taught us material sciences, conservation, archaeometallurgy, early smelting techniques, chemical analysis, experimental archaeology and the use and abuse of statistics. It was her lectures on archaeometallurgy that really fascinated me though and it was from Liz that I remember hearing the theory as to why smith gods in so many mythologies happen to be lame. One of the most common native ores of copper, which was smelted before the development of bronze, is copper arsenic ore, and when it’s smelted it gives off arsenic gas. Prolonged exposure to arsenic gas results in chronic arsenic poisoning, the symptoms of which include sensory peripheral neuropathy, or numbness of the extremities, and distal weakness of the hands and feet. It’s not too difficult to imagine that early smiths must frequently have suffered from chronic arsenic poisoning and that, Liz suggested, was why smith gods were portrayed as being lame. This appears to be a relatively widespread theory now and I’m not sure it can be credited to any one individual, however it’s a fascinating story and one I always associate with Liz. Liz left Glasgow in 1991 to take up the Garstang Chair in Archaeology at the University of Liverpool. At the time, I believe she was the only current female Professor of Archaeology in the UK, Professor Rosemary Cramp having retired from Durham University the previous year. Liz had a long and active career at the University of Liverpool, where she also served as Dean of the Faculty of Arts. She retired in 2007 and died in 2014 at the age of 68. In 2015 the University of Liverpool commemorated her contribution to archaeological sciences by opening the Professor Elizabeth Slater Archaeological Research Laboratories. Liz does not currently have a Wikipedia page, but hopefully I can do something about that this afternoon. ETA And I did! Liz Slater‘s new Wikipedia page was published on Ada Lovelace Day 2017. This entry was posted in history, Wikimedia UK, Women in Tech and tagged ada lovelace day, ald17, archaeology, wikimedia. Bookmark the permalink.